Our 24-hour three-hand TRES 24 watch is now available in two sizes and with two different case materials. We present the smaller 40 mm version in a titanium case. Just like its big sister with a 45 mm stainless steel case, the TRES 24 shows the entire 24-hour day on its specially-designed dial. Three precise hands allow the time to be told to the nearest second. A wristwatch with a 24-hour display may appear somewhat unorthodox at first glance, and may even seem "complicated" to some. When you take a closer look, however, you will quickly realize that the 24-hour display is actually a far more logical way to present the time. After all, one Earth day also has 24 hours, not just twelve. The only reason why a twelve-hour display was introduced in our everyday watches was that this is easier to present graphically than a 24-hour display. However, anyone who is willing to get to grips with twice as many numbers will find that our 24-hour watches present the time in a highly fascinating and indeed logical way, and that they are designed very much in the manner of a technical instrument. With its three hands (hour, minute and second), the TRES 24 allows the time to be told with exactly the same degree of precision as in a conventional twelve-hour three-hand watch. It simply does so in a somewhat more comprehensive and consistent way than a conventional watch. 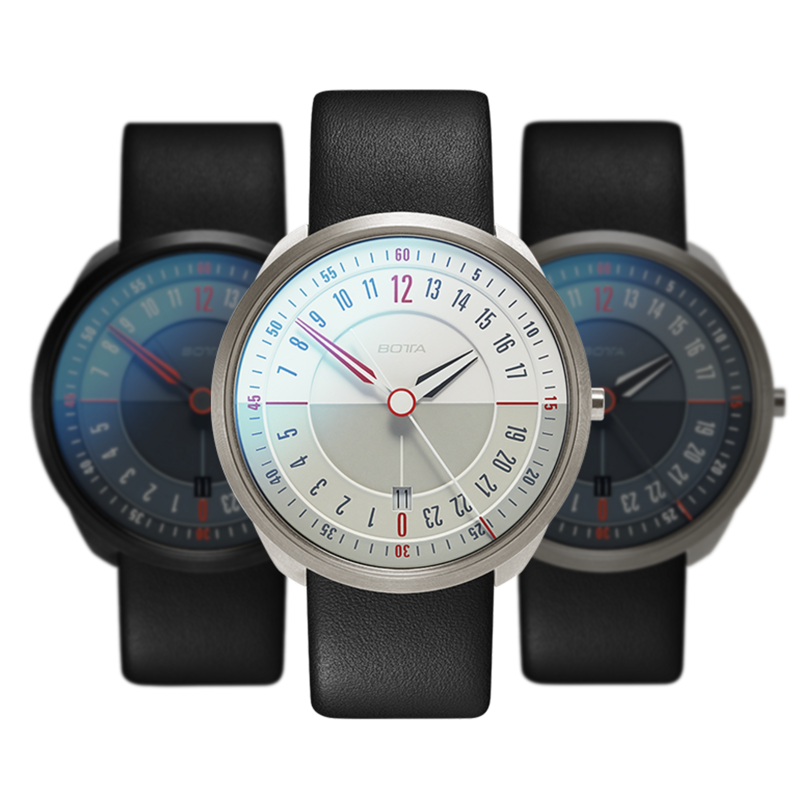 The new TRES 24 is available with two dial colours, black and red, or white and red. Both have a 40mm titanium case featuring first-class workmanship, which also comes in two surface finishes– either in the natural colour of titanium, or with a resilient black PVD coating. Use the slider on the right of the screen to try out and assess the different versions. You can then use our paper model option at the bottom of this website to print, cut out and try on the result. Simply scroll further down the website – have fun trying out the different options! Botta-Design stands for perfection. We are famous for painstakingly designing our products right down to the tiniest detail. This can also be seen in our TRES 24 models: no matter which angle you view the watch from – the front, sides or back – it stands out for its architectural clarity and functional aesthetics. Why not take a look for yourself? 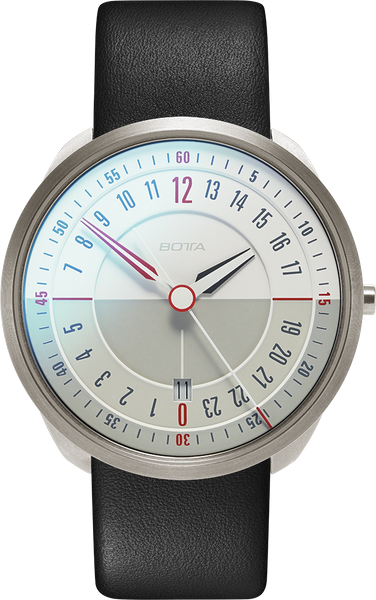 It is not only the watch design that is first-class – its materials and workmanship are, too: a titanium or stainless steel case, PVD coating, dual-domed sapphire glass with anti-reflective coating on both sides, Swiss quartz movements, and high-quality leather, metal and rubber straps are available for this expressive original from Botta-Design. 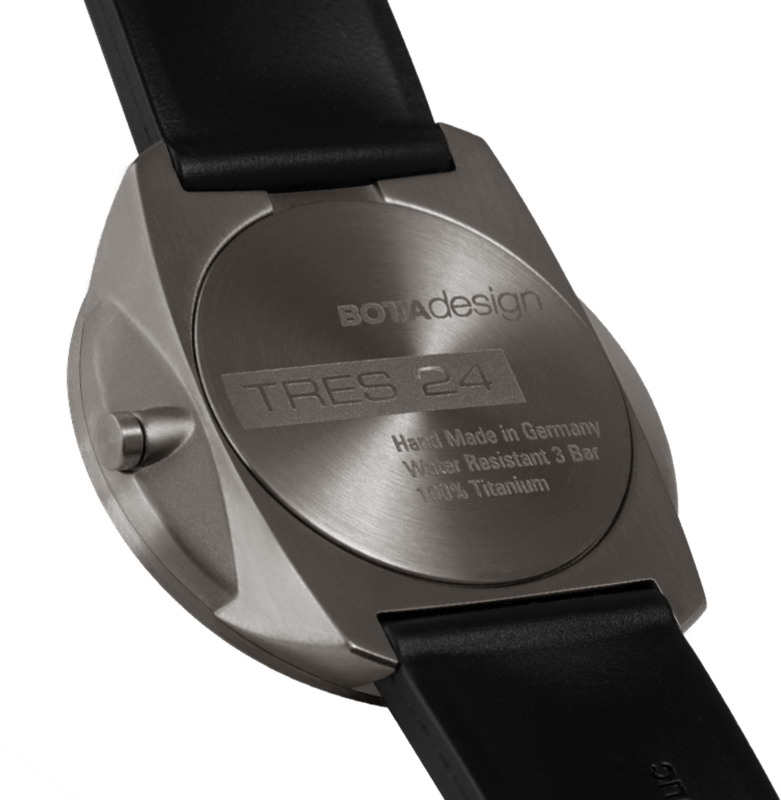 All TRES 24 models are driven by a Swiss-made Ronda quartz movement. Unlike the much cheaper “Swiss-parts” movements, the components in this movement are manufactured and assembled entirely in Switzerland. 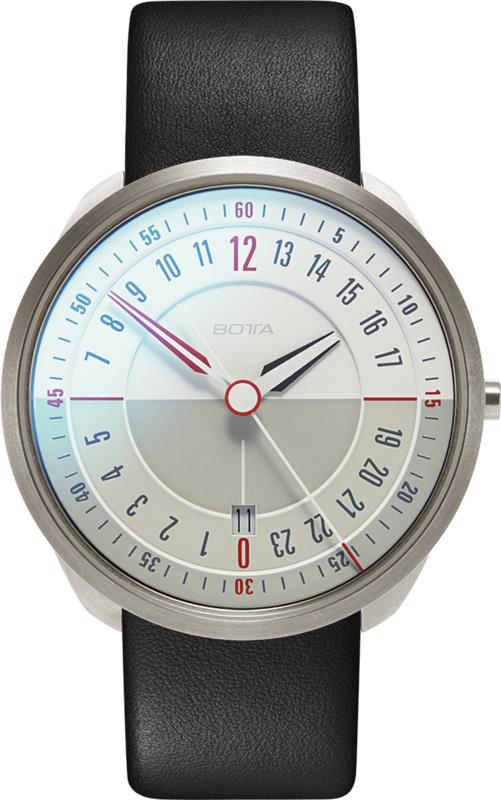 The original Ronda movement ensures that the TRES 24 will run smoothly and precisely for many years, which reflects the Botta principle of technical and design durability in its watches "Made in Germany". The TRES 24 Titanium White Quartz will be shipped . Until then, the model can be pre-ordered at a discount of € -448. Shipment will be on a first come, first served basis.